OCEAN BEACH (NEWS 8) - As kids, some of us set up a lemonade stand to pull in a few extra bucks, but one Ocean Beach boy is not charging a dime for his lemonade. Instead, he is encouraging his customers to help him pay it forward. On the corner of Bacon Street near Cape May Avenue in Ocean Beach, you will find eight-year-old Dylan Rodrigues each Wednesday with his lemonade stand. "I wanted to make money and I didn't know how to do it, so I started a lemonade stand," he said. It all started two years ago. Now, Dylan says he makes about $50 to $60 a day. The second grader has earned $3,000 without charging a penny - his lemonade stand is donation based. Dylan said he began making more money than expected for his savings and slush funds. "I was telling Dylan that it was important because people were paying it forward to him," said Holly Raines, Dylan's mother. So, Dylan began a pay it forward fund - emphasizing on donating supplies, not money. For example, Dylan donated 30 backpacks and lunches for the homeless. Amanda Hunt, an Ocean Beach resident, said Dylan is "a shining example to all kids." Dylan partnered with the International Rescue Committee for a toy drive where he hand delivered toys to 50 families. 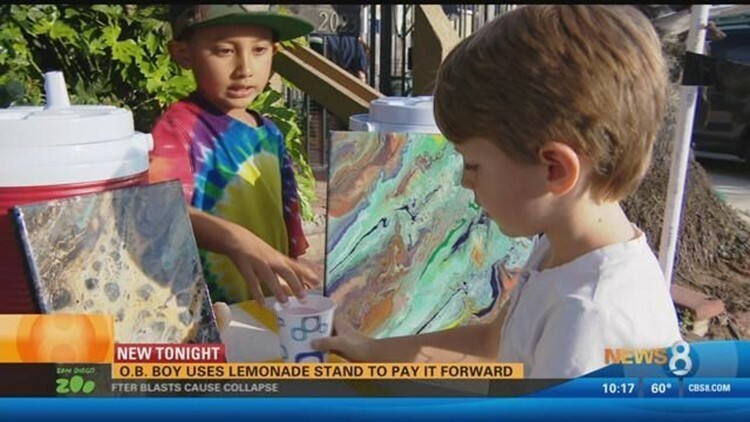 He also spent $50 of his personal money towards the $1,400 raised selling lemonade and his own art for the Specialty Produce's relief efforts for the victims of Mexico's deadly earthquake. "I just wanted to help people that did not really have any money," said Dylan. Dylan's kindness had already spread in the community. Down one street corner from Dylan's lemonade stand, there is some friendly competition - two 12-year-olds selling banana and pumpkin breads. It's a stand that was created for a seventh grade business math class. "We are friends but call each other "enemies" when we are selling," said Kianna Taylor. While both stands may be in competition, they both share one common ingredient - love. Dylan also has an Instagram page and an Etsy page, where his art is available for purchase, as part of his effort to pay it forward. Also, you can reach Dylan via email at: dylpicklelemonade@hollybraines.com.